His Excellency Sheikh Nahyan Bin Mubarak Al Nahyan, Minister of State for Tolerance in the UAE government, conferred Global Education Leaders awards upon nine eminent education leaders from India for their exemplary contribution in various spheres of education and social development during the second edition of the India-UAE Partnership Summit convened in Dubai on October 30-31. Among the invitees on the occasion were Navdeep Singh Suri, Indian Ambassador to the UAE, and Manpreet Singh Badal, finance minister of the Punjab state government. The annual India-UAE Partnership Summit (IUPS) is an inter-governmental event designed to promote investment from the UAE in India and vice versa. The focus areas of IUPS 2018 were small and medium scale enterprises, skills development and education. The event staged at the glittering state-of-the-art Atlantis Hotel, Dubai was jointly hosted by the Indian embassy, the United Arab Emirates Ministry of Economy, Business Leaders Forum, UAE and Afairs Education Advisory and Consulting Pvt. Ltd India. Guest of Honour Dr. Abdulla Al Karam, Chairman, Board of Directors & Director-General, Knowledge & Human Development Authority (KHDA) and special invitee Nunzio Quacquarelli, Founder & CEO of the London-based QS World University Rankings, delivered special addresses at the summit. 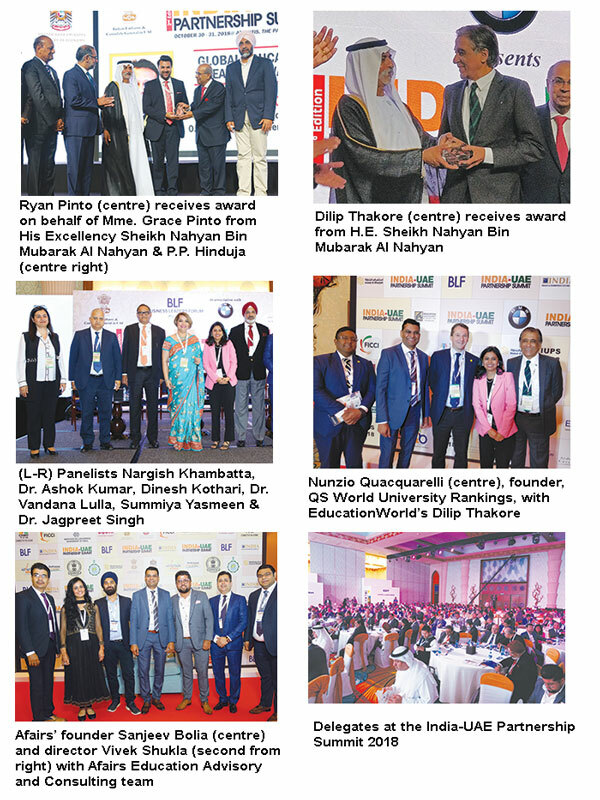 The two-day education summit was attended by over 400 delegates from India and UAE comprising prominent education leaders, vice chancellors, academics, school principals, education entrepreneurs and leaders of edtech companies. “The first education and social sector interaction between education leaders and professionals from India and their UAE counterparts was a great success. With edupreneurs, academics and faculty from both countries having been introduced and having exchanged information about the top-ranked institutions in both countries, interaction between India and the UAE in education is certain to intensify in the near future,” says Sanjeev Bolia, the promoter-chairman of the Kolkata-based Afairs Education Advisory and Consulting which conceptualised and orchestrated the education sector programme at the India-UAE Partnership Summit 2018.